This weekend, my husband was offered a job. A really great job at a firm in Baltimore that he respects and admires, that he’s insanely excited about. Some things (like lodging) are still a little up in the air, but, as Dan described it to my mother, we’re getting things on track. We’re recovering. You may ask, what are we recovering from? Well, to be honest, living in DC was never part of the plan. In fact, living in Maryland after I graduated was never really the plan. Before Dan and I started dating, my plan revolved around one thing and one thing only- the Peace Corps. I spent years tailoring my resume to fit their needs and the fall of my senior year of college I was accepted and placed, heading to the Spanish speaking Caribbean. And then the medical screening began. When I was in college I caught mono (from my roommate, thankyouverymuch), which morphed into shingles (I know, right?) and then, finally, an eye condition called keratitis. Which, it turns out, the Peace Corps has a problem with. First, they just medically deferred me. I was crushed, but planned to work for the year long deferment and then leave. Start my life as planned. Soon thereafter Dan and I started dating. When we got serious (immediately) the conversation kept circling back to what we were going to do while I was abroad. Would we break up? Would we do the long distance thing, me teaching AIDS education on an island far away and him eating hot pockets in Pennsylvania? None of it made sense. Until we decided to go together, to live my dream together. We started planning our wedding then, all the while fighting my deferment. My year came and passed and the Peace Corps returned my phone calls less frequently and with more cryptic responses. Eventually they came out and said it- I was too high risk. Even though my eyes were in remission, the threat of a relapse while I was living in a developing country was too much for the Peace Corps to agree to, so I was out. We were out. It’s been a long process putting the pieces back together, figuring out what our next steps were and recovering. This website is a byproduct of the journey, one of the only things about the experience that doesn’t bring me to tears. I was devastated when my plan came crashing down around me, and for the first time we have a definite plan outside just being together. We’re moving to Baltimore, we’re starting over, we’re getting back on track. And I appreciate having you along for the ride. This whole process of apartment and job searching, moving cities, has left me feeling really emotional and nostalgic. Living in DC was always supposed to be a stop in the road, and now it feels like it was. The destination has changed, but with it new and exciting things have come into our lives. 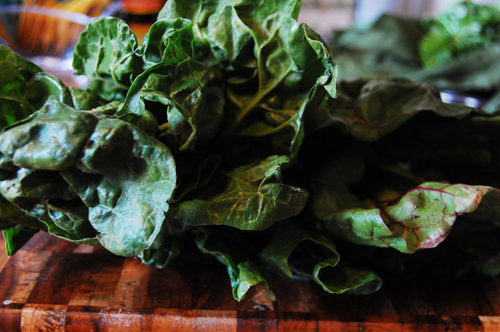 For instance, I know now that I harbor a deep love of rainbow chard. Especially when you pair it with cheese and potatoes. I’m taking this as a good sign. 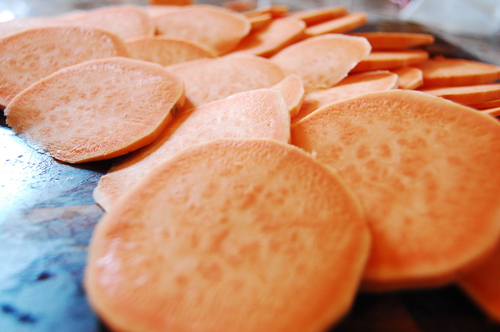 Peel and slice your potato. 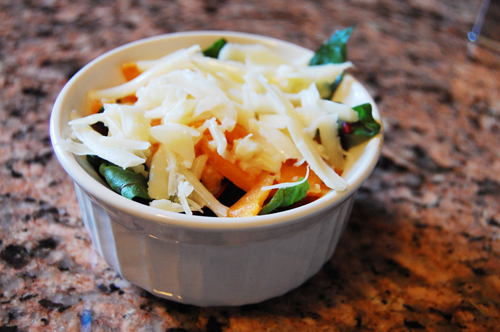 In your ramekins (or in one larger serving dish) layer potato, chard, and cheddar. 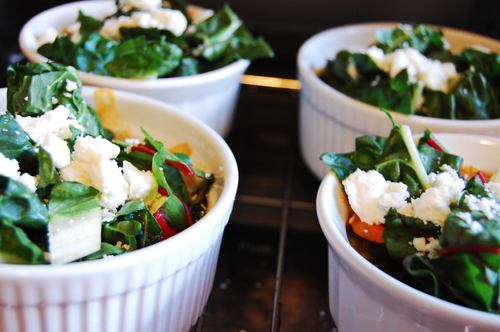 You should have 1/2 cup chard left over. End with a layer of cheese. Pour the milk into the dishes, pouring along the edges so as not to disturb the cheesy layers. Cook in a 325 oven for 45 minutes. 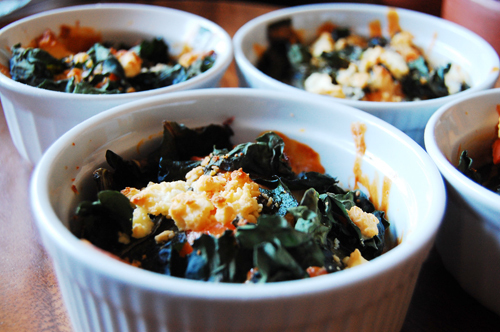 Pull the ramekins out and add the remaining chard. Sprinkle feta on top and cook for another 45 minutes. Serve. Yeah, Biscuits and Such is coming to Baltimore! Hope to see you at the next blogger get together. So happy to hear your husband found a job in Baltimore! I tend to think it’s a pretty awesome place, but then, I’ve lived here forever, so I’m likely biased. Looks delicious! And congrats on the new job, potential move, etc. I understand about the years in DC being sort of unplanned–and here’s to moving on! This looks great, but what happens with the milk and garlic clove? Does the milk get poured over the mixture after the initial assembly? So sorry Pat! You pour the milk in right before baking. Totally forgot to write that! Thanks, Elena. After I asked, I figured that had to be the case and went ahead and made the recipe. I omitted the garlic, though, since I didn’t want to add it raw. The gratin came out really well. Great combination of flavors. I made it in two small oval Le Creuset gratin dishes. Thanks for the idea. There’s nothing like using garden fresh vegetables in your favorite recipes!